Minister for Transport, Tourism and Sport, Paschal Donohoe TD, today said that an allocation of almost €10bn for his Department, over the next seven years, will allow for appropriate levels of investment to be made in public transport to maintain and improve the existing network. It will allow for the growing problem of urban congestion to be addressed and for the sustainable transport agenda to be supported. Six billion euro is being made available to support the development of the road network, with provision also being made for a strategic rail line to serve the transport needs of North Dublin, which is one of the fastest growing areas in the country. Funding will also be allocated for the DART Expansion project, with an allocation being made for the redesign of the DART Underground, which remains a key element of integrated transport for the Greater Dublin Area. Funding for the Department of Transport, Tourism and Sport is being made as part of the Government’s overall Capital Plan, as announced by Minister for Public Expenditure and Reform, Brendan Howlin TD. Speaking this afternoon, Minister Donohoe said: “This allocation of almost €10 billion for my Department reflects the priority that Government places on transport and delivering a well-functioning transport system that facilitates a growing economy. By planning now for the years ahead we will ensure that the services we deliver can adequately meet our needs so that continued future economic growth is supported”. “As transport investment decisions are longer term, my Department’s element of the Government’s overall Capital Plan is longer, at seven years (2016-2022). An investment of this level signals that we are serious about addressing the needs of an economy that is in recovery and that we are willing to invest in meeting future demands, in so far as expenditure limits will allow. “This Plan is the result of the work carried out by my own Department and the National Transport Authority (NTA) who have carefully considered Ireland’s transport needs now and into the future. The transport element of the Capital Plan is framed by the recommendations set out in Strategic Investment Framework for Land Transport (SIFLT) report, which has been published by my Department. “The Plan announced today will restore transport investment to comparable international levels by 2020, allow us to maintain, renew and address critical gaps and pressure points in our existing infrastructure and address urban congestion by encouraging people out of their cars and onto public transport. – An on-going maintenance programme to ensure the safety and efficiency of the rail network. 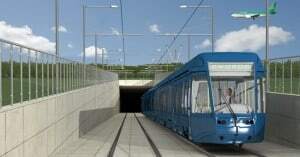 “Funds are also being committed to open the Phoenix Park Tunnel in 2016 to bring some scheduled passenger services on the Kildare Line to Connolly Station; to improve the DART service, increasing frequency and capacity; to build additional and improve existing cycle lanes and to continue with the smart technological upgrades which enhance public transport. By 2020, Exchequer investment will have incrementally reached requisite ‘steady state’ funding levels. By 2022, the additional investment, particularly over the final three years of the plan, will mean critical transport projects addressing congestion and improving the commuter experience are completed and operational, and some new major transport projects are commenced. “As one of the fastest growing areas in the country, Fingal registered the third highest population growth rate in the country (at 13.9%) in Census 2011. The area has been recorded as having close to four times the population growth rate of Dublin City and almost double the population growth rates of the other Dublin counties. A recent review of house planning permissions by the Dublin planning authorities also identified that half of the available sites with planning permission granted, or in the process of being granted, are located in Fingal, with a large proportion centred around Swords. Overall, a large amount of Dublin’s future population growth will occur in Fingal, with Swords representing the centre of that growth, making the delivery of a transport solution that will meet the transport needs of the region essential. “Based on the outcome of the recent North Dublin Transport Study undertaken by the National Transport Authority, the Government has decided that a revised Metro North scheme (entitled new Metro North) is the most appropriate public transport solution to address the transport needs of the Swords/Airport, City Centre Corridor. “This will provide a high capacity public transport link along the City Centre/Airport/Swords corridor which has been an objective of Government for some time. “The revised lower cost new Metro North will be a 16.5km light rail line connecting St Stephen’s Green to Swords, via Dublin Airport. It is expected that construction of the project would commence in 2021 with a view to delivery by 2026/27. Almost 8.5km of the route will run in a tunnel from St. Stephen’s Green to Griffith Avenue and under the airport. The route will serve key destinations such as Drumcondra, the Mater Hospital, DCU and Ballymun in addition to Dublin Airport and Swords offering a journey time of 19 minutes from O’Connell St to the Airport and 31 minutes from O’Connell Street to Swords Estuary. “It is estimated that this project will cost €2.4 billion (excluding VAT). – Smaller stations with shorter platforms, matching the reduced length vehicles. – Retains a large proportion of the value of the almost €170 million invested to date in the Metro North project. “Also, the first phase of a multi-phase DART expansion programme will begin, with the extension of the DART line to Balbriggan. The design and planning for the further phases, which include expansion of DART services to Maynooth in the west and Hazelhatch in the southwest, will also be progressed. The roads programme will total €6bn over seven years. €4.4bn of this programme will be devoted to essential maintenance and strengthening works on our network, restoring our roads to the quality levels required. – A further €600m relates to on-going development of our PPP roads pipeline. – €860m will be targeted at progressing new priority roads projects. – By 2020, roads investment will have reached required ‘steady-state’ maintenance levels. – By 2022, significant progress will have been made in tackling bottlenecks and pinch points across the road network. “The following are some of the key priorities in the roads programme which will support economic growth. Roads will be upgraded into Grange Castle Business Park in West Dublin to provide access for a number of global industries. Work will commence on several roads projects which are targeted at removing critical bottlenecks or upgrading inadequate sections of road: the M7 Naas-Newbridge road widening scheme, the Sallins By-Pass, the Dunkettle Interchange, the N22 Ballyvourney to Macroom scheme, the N4 Collooney to Castlebaldwin scheme, the N5 Westport to Turlough road, the N56 Dungloe to Glenties Road, the N56 Mountcharles to Inver Road, the N59 Moycullen By-Pass and a new Bridge (including approach roads) over the Garavogue river in Sligo. A number of other schemes, also targeting bottlenecks in the road network, will be progressed subject to planning. Examples here include the Shannon Crossing Bridge at Killaloe, Galway By-Pass, Mallow Relief Road, Adare By-Pass, Slane By-Pass, N28 Cork to Ringaskiddy road, N69 Shannon to Foynes road, Athy Southern Distributor Road, Portlaoise Southern Distributor Road, Phase 4 of Dingle Relief road and Laytown to Bettystown Link road. – N25 New Ross By-Pass. “Investment in our public transport system will uphold the principles of the Government’s Smarter Travel policy. Under the Capital Plan, €100 million is being committed to smarter travel and carbon reduction measures, including Greenways, to ensure that the transport sector makes a major contribution to climate change mitigation targets. 1 Northumberland Place, Dun Laoghaire, Co Dublin, Ireland. CIF Construction magazine is the official publication of the Construction Industry Federation in Ireland. The magazine and Constructionnews.ie is published by Foundation Media.